Born into the sacred stilt-dancing tradition of the Mahouka people in northwest Ivory Coast, Vado was born to dance. His father and uncle taught him the sacred ways, and soon Vado demonstrated rare excellence in the age-old customs. Discovered as an adolescent by talent scouts, Vado joined the budding Ballet National de Cote D’Ivoire in Abidjan, training in the traditional dances of over 60 ethnic groups of the Ivory Coast. Hailed as a captivating performer internationally, Vado’s career as a principal dancer spanned 15 years in the Ballet. Most impressive were his acrobatic dances of the Tall Mask, “God of the Sacred Forest”, Gue-Pelou. In 1989, Vado established his own dance company, L’Ensemble Kokiegna d’Abidjan, in Abidjan, touring Ivory Coast and Australia. He re-established his company in New York City in 1994 as Kotchegna Dance Company, developing a corps of multicultural dancers and a repertoire that is widely loved and admired. Choreography began for Vado at the Ballet National. He has been commissioned by dance companies, theatre companies and schools to create powerful traditional dances, and has inspired many students and teachers to integrate his culture into their dances. Vado is a guest artist with many illustrious performers, artists and dancers. He has been a part of Tamango’s Urban Tap ensemble for many years, touring the US and Europe. 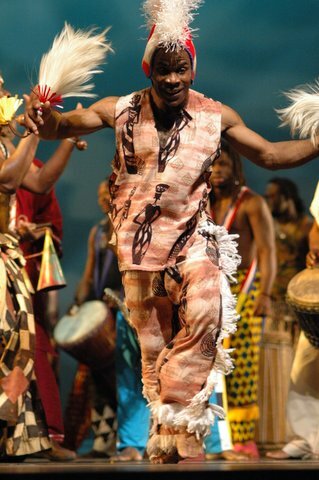 He has contributed to Maimouna Keita, Umoja, Les Merveilles de Guinee, Seventh Principle, Les Ballets Africains, Ballet Djoniba, Masabo, Spirits SOA, Ancestral Messengers, as well as Haitian, Brazilian, tap and modern dance companies. As the heartbeat of all West African musical traditions, the drum is an integral part of Vado’s artistic life; he has drummed all his life. He often creates drum pieces for performers of all kinds, and is a beloved drum teacher.